Researchers at Cold Spring Harbor Laboratory (CSHL) have discovered that a protein called Importin-11 protects the anti-cancer protein PTEN from destruction by transporting it into the cell nucleus. A study they publish today in The Journal of Cell Biology suggests that the loss of Importin-11 may destabilize PTEN, leading to the development of lung, prostate, and other cancers. PTEN prevents tumor cells from growing uncontrollably, and mutations in the gene encoding this protein are commonly found in many different types of cancer. Some patients, however, show low levels of the PTEN protein even though their PTEN genes are normal. CSHL Associate Professor Lloyd Trotman and colleagues discovered that this may be due to defects in Importin-11, which transports PTEN into the nucleus, sheltering PTEN from proteins in the cell's cytoplasm that would otherwise target it for degradation. Several cytoplasmic proteins—NEDD4-1, NDFIP1, and UBE2E1—combine to tag PTEN with the small molecule ubiquitin. PTEN tagged with multiple ubiquitin molecules can then be recognized and destroyed by the cell's protein degradation machinery. Trotman and colleagues found that Importin-11 protects PTEN from degradation by escorting not only PTEN but also UBE2E1 into the nucleus, thereby breaking up the cytoplasmic ubiquitination apparatus. 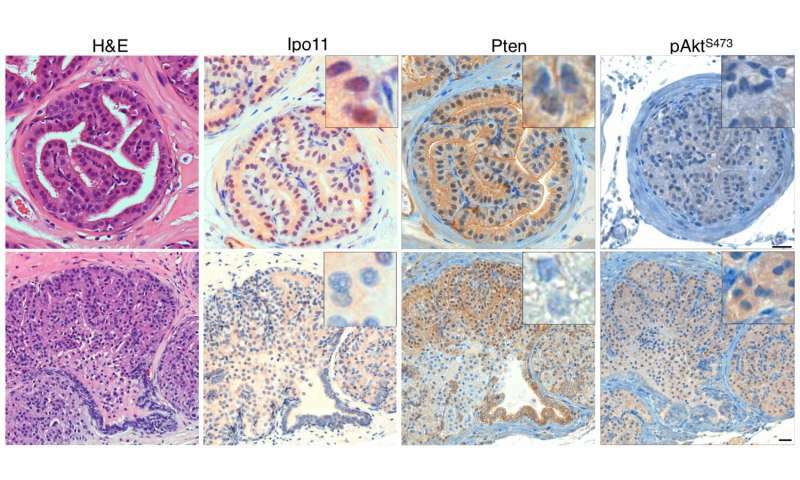 Mice lacking Importin-11 showed lower levels of PTEN protein and developed lung adenocarcinomas and prostate neoplasias. Mutations in the gene encoding Importin-11 have been identified in human cancers, and Trotman and colleagues found that tumors from lung cancer patients lacking Importin-11 tended to show low PTEN levels as well. The researchers estimate that loss of Importin-11 may account for the loss of PTEN in approximately one-third of lung cancer patients lacking this key anti-cancer protein. In prostate cancer, loss of Importin-11 predicted disease relapse and metastasis in patients who had had their prostate removed. 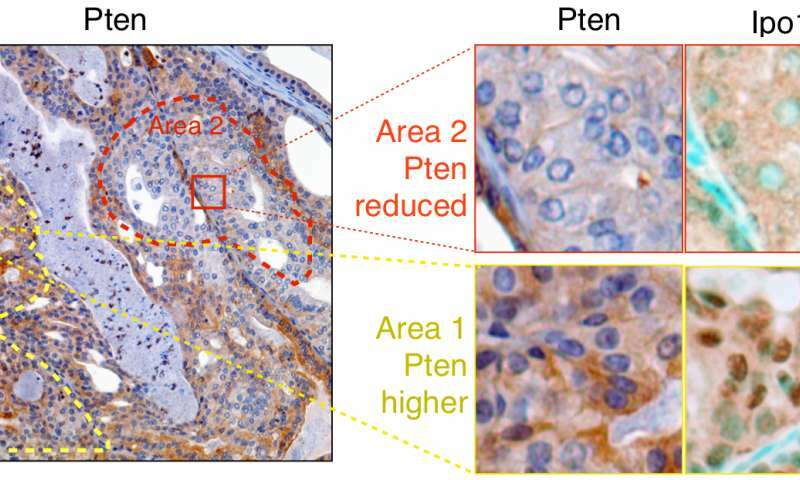 "We think that the degradation of PTEN after loss or impairment of Importin-11 is a very effective driver of human prostate cancer," says Trotman. "Our results suggest that Importin-11 is the 'Achilles' heel' of the ubiquitination system that maintains the correct levels of PTEN inside cells."